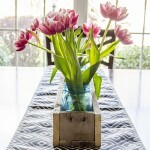 I will freely admit, I am someone that feels stifled by too much organization. 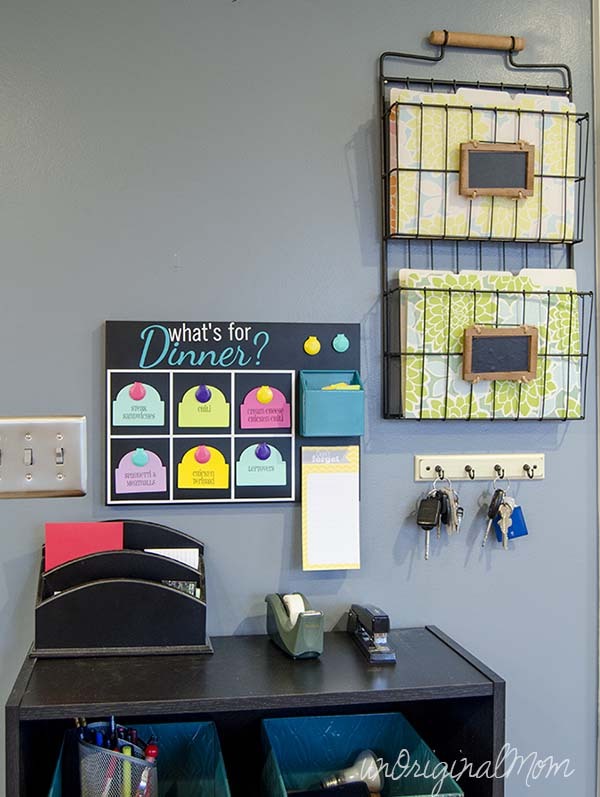 Don’t get me wrong, I “ooh” and “aah” over flawless labels on beautiful containers…or command centers with a place for everything…or spotless pantries with cans stacked perfectly…or weekly cleaning schedules with chalkboard checklists. I admire them, but that’s just not realistic to me. And when I try to attain something like that, I feel really great for the day or two that it actually works…then feel like crap when I get behind on keeping it up and discouragement sets in. I prefer something in between chaos and perfect order that’s a little closer to reality – methods of organization that make it easier to stay on top of the mess rather than fall behind it. For me, that’s something with a little bit of wiggle room for life to happen. That’s how this menu planning board was born! I’ve seen many a weekly menu planner with a label for each day of the week, and I just couldn’t bring myself to stick to something like that. I like the freedom to say, “I don’t feel like chicken tonight,” or “I really want to try this new recipe I found today,” or “I had a really bad day and don’t want to cook anything, let’s just do a frozen pizza on paper plates.” But at the same time, I absolutely hate the 4:00 question “what the heck am I going to make for dinner tonight?” followed by aimlessly staring at the pantry shelves for 10 minutes. So here is my solution! A menu planning board that doesn’t force me to pick exactly what the menu is for the week, but instead gives me a list of our regular meals to pick from and put in an easy-to-see place. I can pick out 6 (or more) meals, make a grocery list for them, go shopping, and be good to go for the week. Why only 6 and not 7? Because inevitably something is going to come up on one day of the week – getting an invite to dinner at my parents house, eating out, deciding to try a new recipe, ordering a pizza, whatever! But because I don’t have a specific meal planned for a specific day, I have the freedom to do that without getting stressed out! 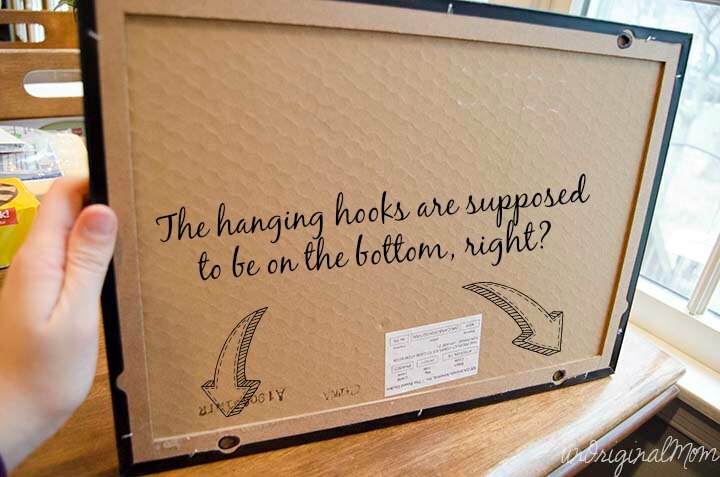 Now, for the DIY Details! 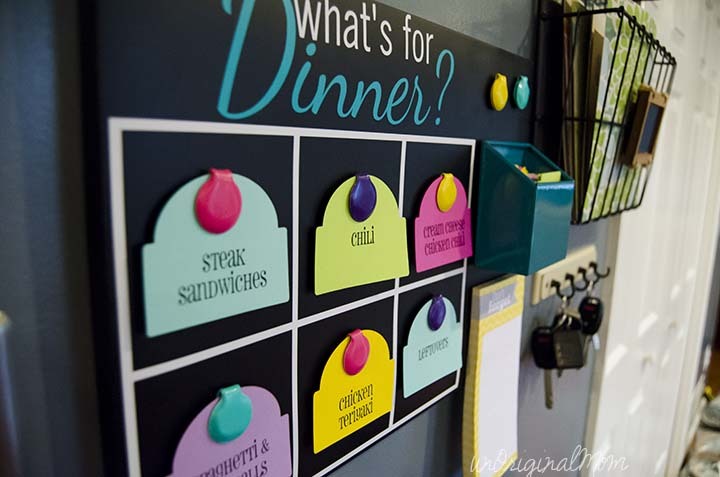 I used a magnetic chalkboard from Target, along with a magnetic pencil holder to hold my meal tags and colorful magnetic paper clips. Then I used my Silhouette to cut the grid and title out of vinyl. Want the cut file? Fine print: This design is for personal use only. I’d love for you to follow me via Facebook, Pinterest, or Twitter in exchange for the download…of course, it’s not mandatory, but very much appreciated! 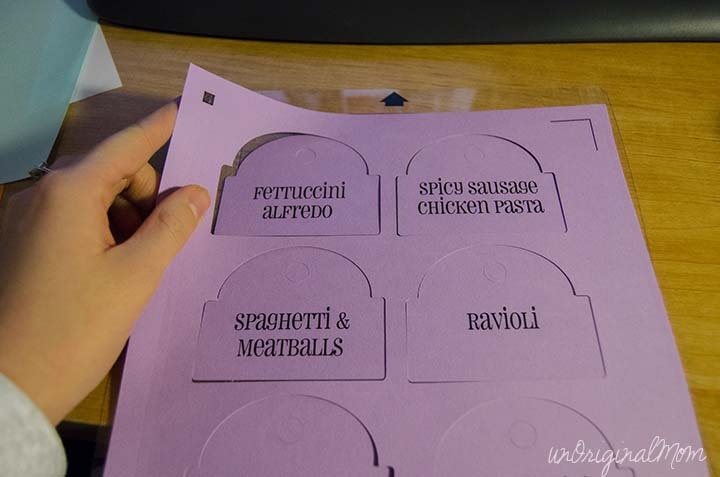 Finally, I made a list of all our regular meals and made print and cut meal tags – using a file from the Silhouette Store for the tag and the free font Pharmacy for the letters. I color coded them into the following categories – Quick and Easy, Slow Cooker, Chicken & Fish, Beef & Pork, and Pasta. That way it’s easy to work variety into the week’s meals by making sure the board is always colorful! You could easily add the required ingredients or even the recipe (in tiny type) on the back of the cards. These are all recipes in our regular rotation, so I know the ingredients off the top of my head…but as I add meals (I printed several blank cards) I may jot down a few things on the back to help me with my grocery-list-making. 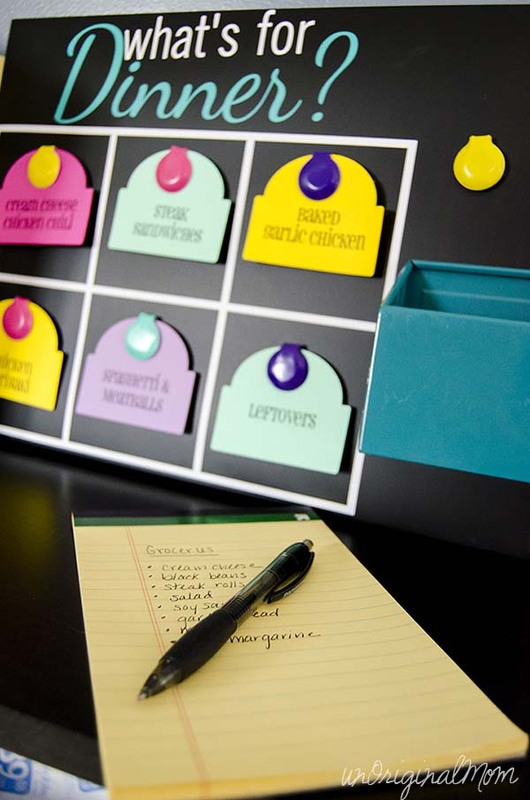 All the tags are stored in that magnetic pencil holder, and I found a magnetic note pad in the Dollar Spot at Target to add underneath – it makes it really easy to pick my 6 meals and make my grocery list for the week. 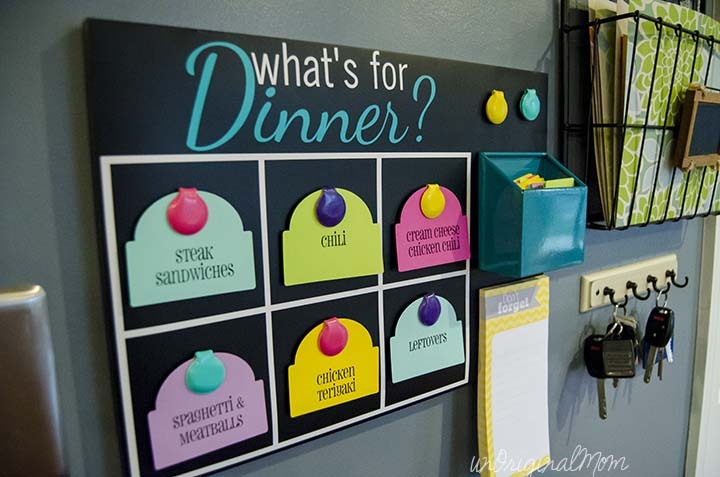 One word to the wise…make sure that BEFORE you add your vinyl and create your beautiful meal planning board, you make sure the board is right-side-up. Whoops. 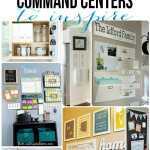 (What do you think of the start to our “Command Center?” I still have a few things to add…but I’m loving it so far!) UPDATE – here’s our finished Command Center! Psst! 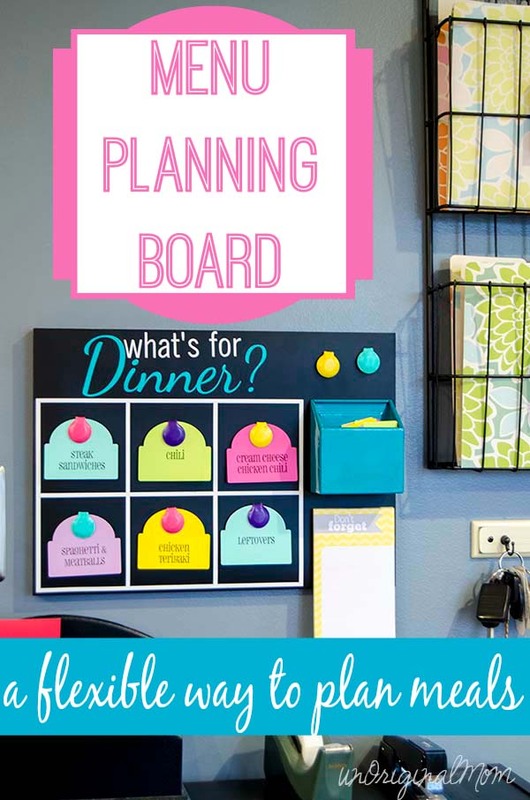 Right now I’m giving away a FREE 11 page printable meal planning guide – based on THIS menu board – as a gift for new email subscribers! Sign up by clicking HERE and have the freebie delivered straight to your inbox! 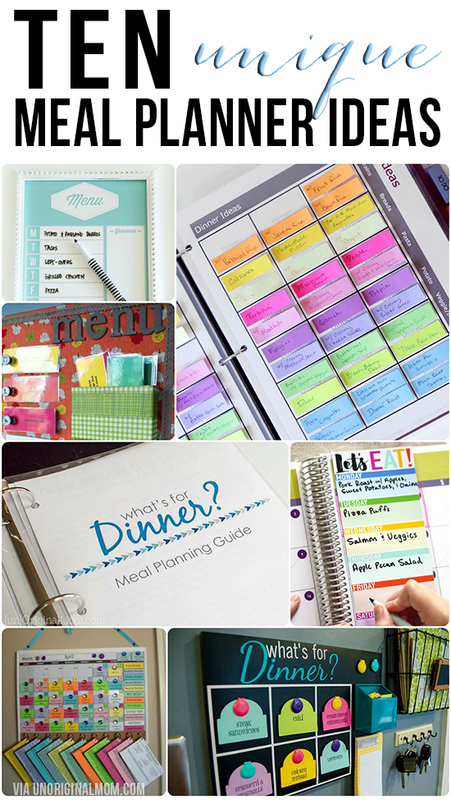 Want some more meal planner ideas? You’re sure to find one in this list that will work for your family! That’s right, this is the 2014 version of the Silhouette Challenge – with THEMES! So grab a cup of coffee and get browsing through these THIRTY-SIX (!!!) 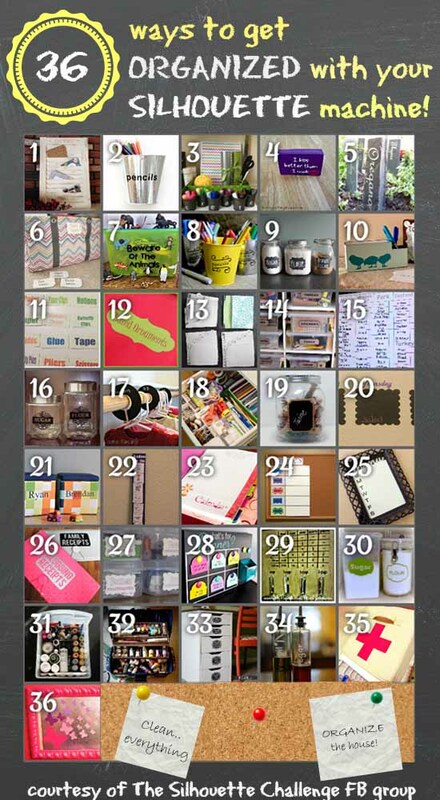 awesome organization projects from some bloggy buddies of mine – all made with a Silhouette! Wow-ee! Are you inspired? I sure am! 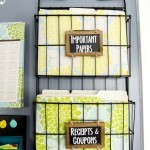 Do you have any organizing projects on your to-do list? 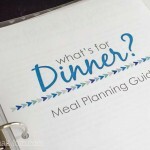 68 Responses to “What’s For Dinner?” Menu Planning Board – with FREE Cut File! This is just awesome! I couldn’t wait to pin this. I love what you have done with your command center so far. Great, great, great! Very cute and I love the colors you are able to add by using the paper cut outs. Great idea! Thanks! I’m not always a bright-color person, but I couldn’t resist those tags! I need one of these!!! I have become so complacent with meal planning… my planning typically doesn’t start until around 530 when we’re all grumpy and hungry. Thanks for the inspiration and motivation!! That is totally me! And of course at that point, the only options are something quick (and probably not super healthy or cheap, cause I usually go with a frozen skillet meal or frozen pizza) so I’m hoping this will help our nutrition and our wallets, too! Love this, and want to try it out sometime but need to resource the materials, I live in the UK. Sorry I can’t help you out with that, Sandra! 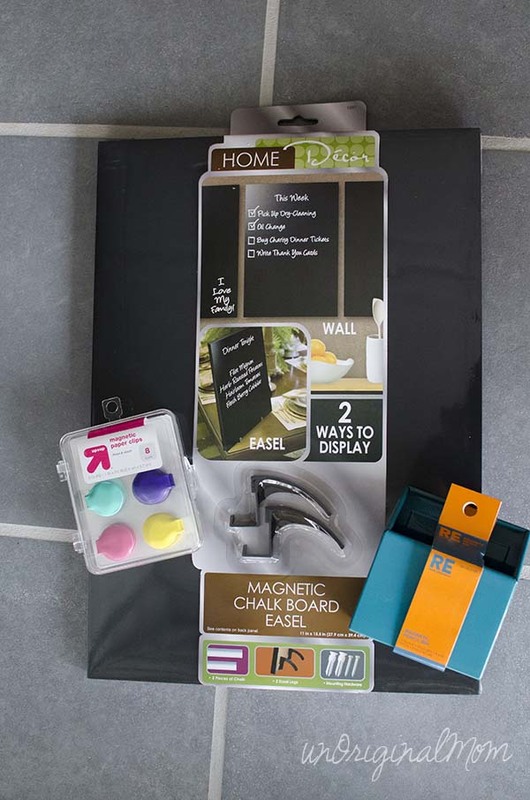 But if you can find a place online that sells vinyl, I’m sure you can find a magnetic board somewhere locally…you could even use a white board if you can’t find a magnetic chalkboard! I don’t even know where to begin! The colors are amazing, the color coding is even better, and the fact that you can switch your meals around is just awesome. So many great little details. I want one of these! It looks so pretty… Love everything about it! Planning meals is the best ever! Thanks for sharing those cut files =D Pinning!!! Aw, thanks so much Camila! I am hoping this will help me get in the habit of planning our meals! I love how you don’t have assigned days for your meal plans! I make a meal plan with days assigned, but I always change at least one! So cute…i’m going to have to remember that font! Thanks Rachel! I knew there was no way I’d actually stick to a planned schedule, so I just left out the assigned days :-) I hope that will help me stay with it! Gotta love cute and functional! It’s awesome! I absolutely love this idea! I’m pinning it to make one of my own. Thanks for the cut file. I so would love to do this. I keep saying I need to make one but I do a new type of meal each week. I will have to find a fun way to add all the new recipes. You’re very welcome, Alexis! I tend to do the same thing…try lots of new recipes and then forget about them! This has been a great way to make sure I remember to come back to all of our favorites. And I agree, I am VERY thankful for my helpful hubby, I don’t know what I’d do without him…he’s helped me out in many a pinch! Where did u get your folder hanger thing? I got it at HomeGoods! Though it took several different trips to find it…they didn’t have ANY around Christmas time, but finally when I went back in early January they had several to choose from! OMG we are going to target today and getting the stuff to make this!!! I love it!! First of all, it’s a crying shame that I am JUST now getting over here to see this. Second, I’m SO glad I finally did because this is AMAZING! I don’t know what I love more – – the bright n’ bold color palette or the flexibility! It’s so true – – things inevitably come up and you do always end up changing things around – – so the 6 day flexible cycle is so genius. Well done, my dear. Well done. I love the menu board you made and the fonts used and colors are fantastic! I would love to make one but I cant seem to open the download due to it being a .studio file. Is there any way I can get the down load in a . pdf version or at least get the dimensions for the square grids so I can free hand one of my own? not able to hamper you, are arrears, late payment, defaults, County Court Judgments and IVA. We excel in customer service and ensure we treat each customer with priority. Hi Nicole! I just used regular old colored card stock for the tags…I did a “print and cut” to make them, so the lettering is printed, then I used my Silhouette to cut them out. To do a print and cut, all you need to do is add registration marks to your design, then follow the prompts in the software to print, load into the Silhouette, and cut…it’s really pretty simple! Hope that helps, but if not, there are some great print and cut tutorials on YouTube! I’m always looking for better ways to keep track of our family meals. I love the board and labels you made! I have our kids pick the menu for a week, but I adjust the meals to different days according to our schedule. Thanks for the freebie and awesome post! (If you want, you can check out my post on meal planning). Your idea may just be what I need to add to our family’s planning system. Thanks! I needed that! So glad you found this helpful! It’s so hard to keep track of everything, isn’t it? So fun that you let your kids pick the menu for the week…I bet that makes them excited for dinner each night! Oh! I forgot to tell you, I found you from Craftionary. This is my first time visiting your site, and I love it! Meredith – I have five children. Only the first to ask the dreaded dinner question was given the answer. After that, I would say, “I answered that already,” and off she would go to find out who knew. Now that they are all grown, the question is no less tiresome (since often, I’m all the more busier these days and don’t have dinners planned out like I use to ;-). What a cute solution you have here. Oh, that’s smart! I’ll have to implement that when my kids are a bit older…because I’m already tired of the question!! Hi! Thanks for the great idea, I love your board! 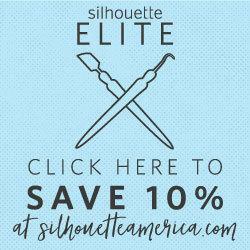 Quick question, how do I find the shape in the Silhouette store? Hi Katie! If you’re talking about the tags, they are one of the shapes in design #43588 in the store (just search for that number)…the grid and title I made myself and are free to download using the link in the post! Hey Meredith! Do you have a list of your regular meals? And which ones fall into the different colored categories? The link for the vinyl template isn’t pulling up on my mac, any advise? Hi Jayla, it is a cut file for use with Silhouette Studio only. It won’t show in the preview, but when downloaded it should open in Studio if you have the program downloaded on your Mac. Let me know if you still have trouble!